Reference number for this case: 4-Oct-54-Concarneau. Thank you for including this reference number in any correspondence with me regarding this case. A beer merchant of Concarneau saw, on his side, two luminous discs of the shape of round "tables" prolonged of a tail. Quimper, October 6. -- Towards 4 o'clock, yesterday morning, Mr. Pierre Lucas, working baker in Loctudy (the Finistère) who was occupied drawing water in the court of bakery, saw suddenly in the night, a machine of the shape of a saucer of 2,50 m to 3 m of diameter. He saw an individual measuring approximately 1,20 m emerge of it, who approached him and tapped to him on the shoulder while uttering inintelligibles words. The workman baker succeeded in keeping his coolnes and returned to the bakehouse where the unknown followed him. The author indicates that a few minutes after the case of Loctudy on October 5, 1954, a beer merchant of Concarneau observed during 10 minutes the maneuvers of two flying saucers above this city. These luminous craft had the shep of mushrooms prolonged of a kind of highly enlightened tail. One of the two discs remained motionless while the other moved in the vicinity. The two spacecrafts then move away after having launched a luminous line which resembled a rocket. Ufologist Aimé Michel rerports that on October 4 at about two o'clock in the morning, two luminous objects flying together have been seen in Concarneau. 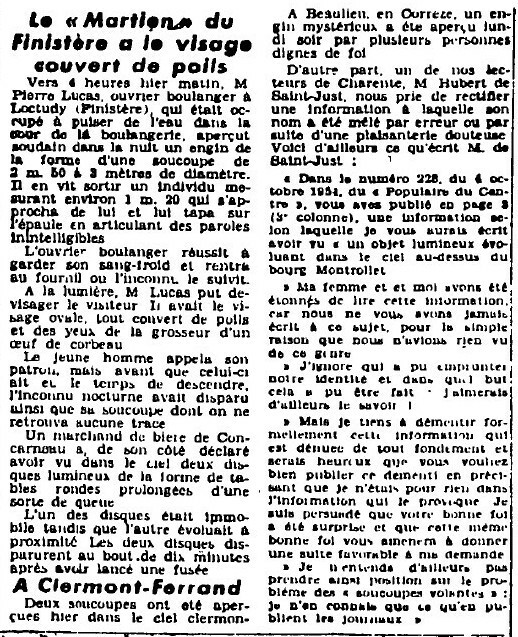 Luc Chastan notes in his database that in the Finistère in Concarneau on October 4, 1954 "Around two hours of the morning, two luminous objects flying together were seen." 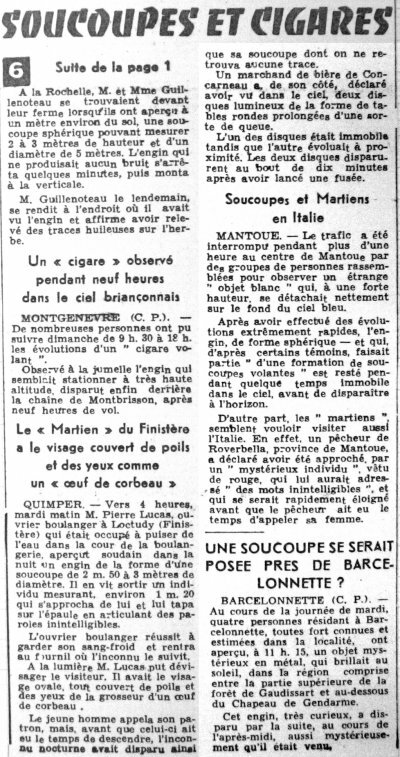 The website indicates that on 4 October 1954 around 0200 in Concarneau, France, "Unidentified objects were sighted, but with appearance and behavior that most likely would have a conventional explanation. Two objects were observed." The sources are indicated as: Michel, Aime, Flying Saucers and the Straight-Line Mystery, S. G. Phillips, New York, 1958; Vallee, Jacques, Computerized Catalog (N = 3073). Testimony nr. FR 29 900 1954 10 04 .. ..
Not looked for yet. Possible meteors. 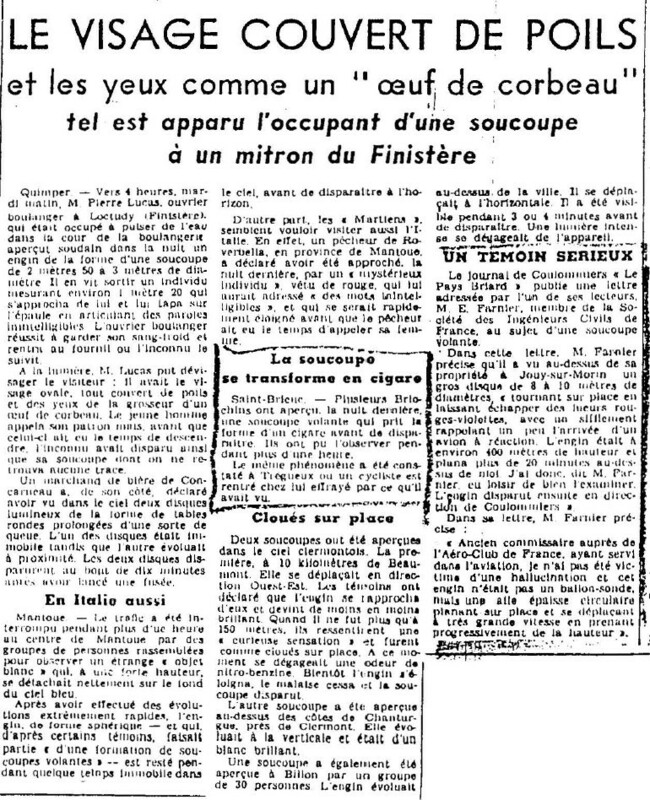 [vm1] Article in the regional newspaper Var-Matin République, Toulon, France, October 7, 1954. [am1] "A Propos des Soucoupes Volantes", livre par book by Aimé Michel, reprint of "Mystérieux Objets Célestes", Planète publishers, France, 1969. 1.3 Patrick Gross August 15, 2010 Addition [lm1]. 1.4 Patrick Gross January 9, 2017 Additions [hm1], [pc1], [ub1]. 1.5 Patrick Gross February 7, 2017 Addition [vo1].